Profiling travelers to find the “good guys” — and recruit them as informers | Papers, Please! Profiling travelers to find the “good guys” — and recruit them as informers – Papers, Please! Most (although certainly not all) of the people who contact the Identity Project for assistance in finding out what information the government has about their travels, or interpreting responses to their requests for travel records, are Muslims. Many of them, Muslim or not, can’t figure out why they were “targeted” for special treatment at US borders and/or airports despite having done nothing wrong. “What do they suspect me of, and why?” they want to know. A recent report by The Intercept based on documents from an anonymous whistleblower source confirms what we, and many of the people who have sought our help, already suspected: The FBI is systematically “looking for ‘good guys’ not ‘bad guys'” among international travelers, to recruit them as informers (“confidential human sources”). US Customs and Border Protection is using profiles and identities provided by the FBI to mine the information airlines are required to collect and provide CBP about passengers on upcoming flights to anticipate when potential informer recruits will be passing through US airports. 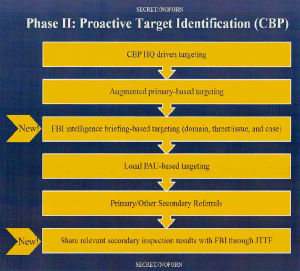 Once these potential informers are targeted, CBP arranges special joint CBP/FBI “welcome parties” to interrogate and search them and assess their ability, willingness, and suitability to serve as CHSs. 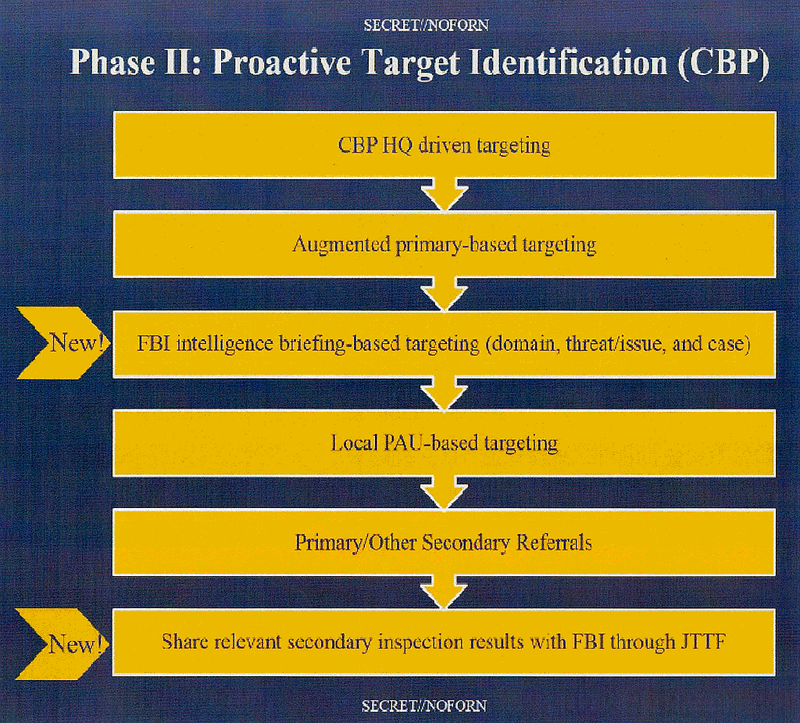 CBP uses its “border search” authority to conduct the searches and questioning, but FBI agents supply the questions and targeting lists and rules, sit in on the interrogations, and follow up with those who are determined to be potential recruits or who come under suspicion as a result of their response to the attempt to recruit them as informers. The story in the The Intercept and the leaked documents published along with it don’t reveal much that we and others hadn’t already suspected. But they do fill out the some of the details. And for anyone who was still in doubt, they show clearly how the government is already using its systematic access to airline reservations for surveillance of non-suspects, and for other general police purposes, contrary to the hollow assurances it has provided to the public and to foreign governments that this data will only be used for prevention of specific categories of crimes. ← Is it suspicious to avoid the police when they might want to ask for ID?